Mariner East 2 pipeline construction crews work in the backyards of homes on Lisa Drive in West Whiteland Township, Chester County, on May 2. Sinkholes that opened in the area prompted the state's Public Utility Commission to order that an existing pipeline nearby, the Mariner East 1, be shut down until it could be determined that the sinkholes didn't threaten its safety. PUC on May 3 approved a re-start of Mariner East 1. 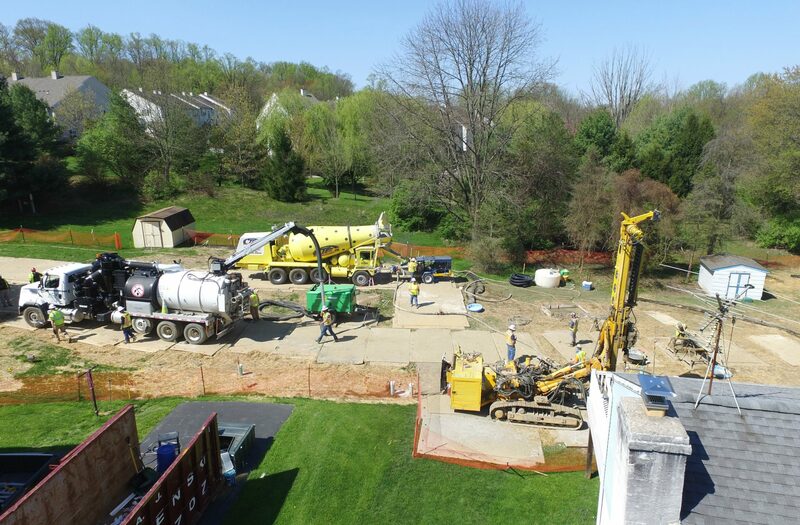 Mariner East 2 pipeline construction crews work in the backyards of homes on Lisa Drive in West Whiteland Township, Chester County, on May 2. Sinkholes that opened in the area prompted the state’s Public Utility Commission to order that an existing pipeline nearby, the Mariner East 1, be shut down until it could be determined that the sinkholes didn’t threaten its safety. Mariner East 1 is now back in service. Sunoco rejected a state senator’s demand that it halt construction of the Mariner East 2 pipeline in a Chester County township where sinkholes prompted the latest delay to the project in March and April. Attorneys for the pipeline company argued during a hearing at the Pennsylvania Public Utility Commission on Thursday that there will be no risk to public safety when the $2.5 billion pipeline is completed, despite claims by Sen. Andy Dinniman, a Chester County Democrat, that it should not be building the pipeline through an area of unstable limestone geology. Expert witnesses for Sunoco, plus the Mariner East project manager, dismissed the concerns of Dinniman and his supporters in some Chester County communities that transmission of highly pressurized natural gas liquids represents a threat to public safety in the densely populated suburbs west of Philadelphia. But a resident who lives near a Sunoco drilling site said water continues to seep across her land some nine months after the company hit an aquifer at the site, and the senator argued that there is increasing legislative and public support for legal curbs on the pipeline industry. The hearing before Administrative Law Judge Elizabeth Barnes was held to argue Dinniman’s emergency petition to stop construction in West Whiteland Township, and to reimpose a shutdown of the existing Mariner East 1 pipeline in the same area. Dinniman’s motion is based on the argument that unstable geology there might cause a leak of natural gas liquids that would endanger public safety. The senator has accused Sunoco of ignoring the interests of his constituents, building the pipeline too close to residential areas, and damaging the environment by leaking drilling fluid and cutting down trees. His argument that West Whiteland was the wrong place to build the pipeline got a boost late last year when sinkholes began to appear at Lisa Drive, a residential development in the township where Sunoco is building the Mariner East 2 and 2X pipelines on the same right-of-way as the existing Mariner East 1 pipeline. ME1 carries natural gas liquids from western Pennsylvania to Delaware County near Philadelphia. In March, the Public Utility Commission temporarily shut down Mariner East 1 and ordered Sunoco to investigate the pipeline’s integrity for a mile on either side of Lisa Drive, saying that any leak of the highly volatile liquids could have a “catastrophic” effect if the pipeline was breached. The shutdown, which ended in early May when the PUC said inspections had found no issue with the pipeline, contributed to the latest delay to Mariner East 2. On Thursday, Sunoco officials pushed back their estimate for the pipeline to begin operations to the third quarter of 2018 from the previous target of the second quarter, and more than 18 months later than originally planned. Tom Long, chief financial officer of Sunoco’s parent company, Energy Transfer Partners, told financial analysts during a quarterly earnings call that 98 percent of the main pipeline is complete and 93 percent of the horizontal directional drilling (HDD), which will enable the pipeline to travel underneath areas like West Whiteland Township, is done or underway. When complete, the pipeline will carry propane, ethane and butane about 350 miles from the Marcellus Shale of southwestern Pennsylvania to a terminal at Marcus Hook in Delaware County, where most of it will be exported. At the PUC hearing, John Zurcher, a pipeline consultant testifying for Sunoco, said that pipelines overall are by far the safest way of carrying fuels including natural gas liquids, and that he was unaware of any pipeline that had failed because of unstable geology. Zurcher dismissed arguments by Dinniman and other critics that the new Mariner East pipelines should not be built alongside Mariner East 1. To find another route would mean cutting more trees and disturbing more natural species, while using the same right-of-way eases maintenance and aids first responders in the case of an emergency, he said. He also rejected concerns that the natural gas liquids should be odorized so that residents would be able to smell any leak. Under cross-examination by Kathryn Urbanowicz, an attorney for Clean Air Council, which intervened on behalf of Dinniman, Zurcher said the proper way to respond to any leak in a hazardous liquids pipeline like Mariner East 2 was to run away – without driving a car which could ignite the escaping gases – and call the emergency services. “What if you can’t run?” Urbanowicz asked him. “I have no answer for that,” he said. Virginia Kerslake, who lives about 250 feet from an inactive drilling site on Shoen Road in West Whiteland, said the activity near her home has been disruptive and that she still has water flowing across her property after Sunoco punctured an aquifer in the summer of 2017. But under cross-examination from Witkes, Kerslake acknowledged that her public water supply had not been disrupted, she had not experienced sinkholes on her property, and that Sunoco had paid her husband $4,000 for the right to use an easement on their land. Matthew Gordon, project director for Mariner East 2 and 2X, said under direct examination that Sunoco had considered alternatives to the route that it had chosen in Chester County, but rejected them because they would have involved “tens of miles” of additional greenfield construction and more deforestation. He said there was no way of building the pipeline through the county without drilling through the “karst” limestone formation. Questioned by Robert Fox, an attorney for Sunoco, Gordon said many other pipelines had been built through the county’s karst, and he was unaware that any had encountered geological problems. The company’s plans had been approved by the Department of Environmental Protection, he said. David Demko, a geologist for Sunoco’s consultant, Groundwater & Environmental Services, agreed that any pipeline built in Chester County will go through karst. But Dinniman, in an interview, said Sunoco had picked some of the most heavily populated areas of the county in choosing to build ME2 and 2X on the same route as ME1, and had failed to consider alternatives that would have taken the two new pipelines across rural areas instead. Dinniman said he had not proposed an alternative route. Dinniman said he had taken his fight against the pipeline to the PUC because it has the authority from the federal Pipeline and Hazardous Materials Safety Administration to ensure pipeline safety. He argued that the hearing, together with the PUC’s action to shut down ME1 for almost two months, and the recent approval by a legislative committee of three bipartisan bills to improve pipeline safety and protect local property rights during pipeline development show that public opposition to pipelines is growing. He said he would never have expected the bills to pass a year ago, but that popular opinion on the issue seems to be changing during an election year. “This popular tide has gained the attention of the people in Harrisburg,” he said. Judge Barnes gave the parties until May 16 to file legal briefs to on their arguments. She is expected to rule shortly afterwards. StateImpact Pennsylvania editor Scott Blanchard contributed reporting to this story.